All proceeds benefit HeartShare Human Services. 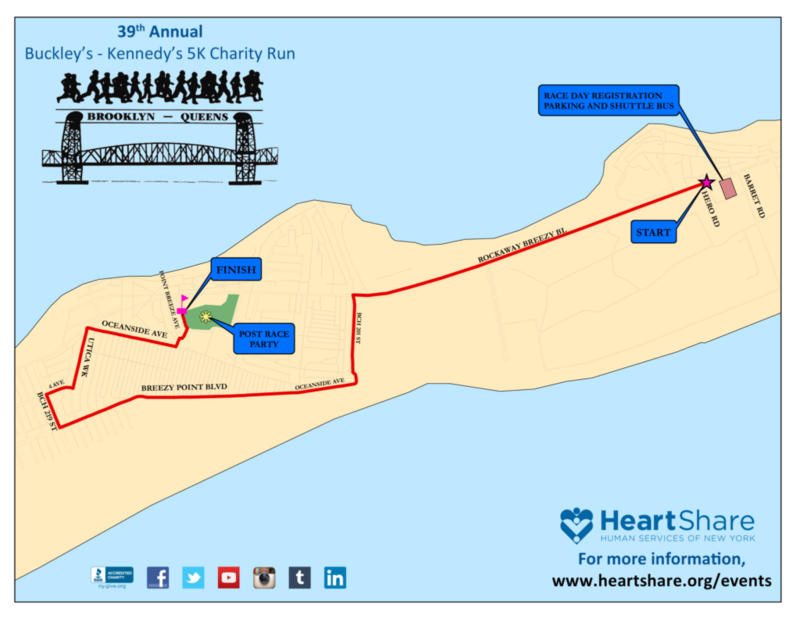 Runners arrive at 9:30 a.m. in front of the Army Reserve Center, located on Rockaway Point Blvd/State Road between Barret Road and Hero Road in Breezy Point, NY. For GPS, use the address of St. Genevieve’s Church: 6 Beach 178th Street, Breezy Point, NY 11697, located across the street from the Reserve Center. Runners clothing must be placed in plastic bags prior to race time. Immediately following the race, runners may pick up their clothes near the runners entrance to the Family Fun Day Picnic. Strollers are allowed behind the field of runners. buses will run between the parking lot and the Breezy Point baseball field from 8:30 a.m. until 4 p.m.
You will not be able to park in Breezy Point. If you’re not a runner but you would still like to be involved with the run, you can volunteer to help out with registration (before and during race day), set-up, clean-up, water stop, mile marker, finish line workers and T-shirt distributors. Click below to find out more!